Library occupies a place of pride at Arya College and is an essential component of the institute’s outstanding research and education mission. 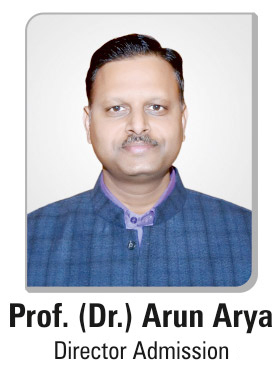 Recognizing the role of library and information services in meeting the requirements of the Institute’s academic, research and training programmers, the Library was set-up as one of the key divisions of the Arya Institute of Engineering & Technology. It is a most lively place on the campus providing a safe, comfortable and friendly environment that enables learning and advancement of knowledge, and promotes discovery and scholarship. With a sitting capacity of over 200 students, the library has a ready stock of books journals, magazines and newsletter from all over the world, replete with all kinds of support activities, like photocopying, audio-visual rooms, electronic media section, book bank and linkage with various reputed libraries in India. The mission of the Library is to facilitate creation of new knowledge through acquirement, association and spreading of knowledge resources and providing for value added services.